Let TP take a jab at it. For the longest time, many Santiago, Binay, and Duterte supporters have given up on the SWS survey results. Many of them believe that SWS is biased, considering that SWS President Mahar Mangahas is Senator Grace Poe’s uncle, suggesting a blatant conflict of interest. 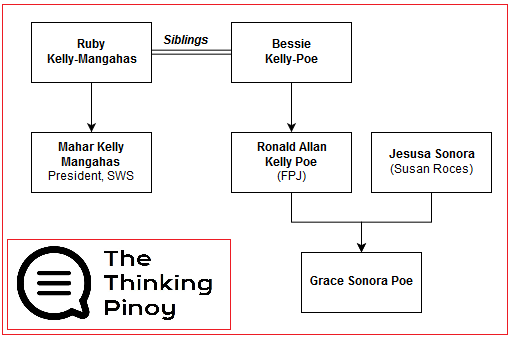 Mangahas’ mother is Ruby Kelly Mangahas, while Fernando Poe Jr’s mother is Bessie Kelly Poe [Philstar]. 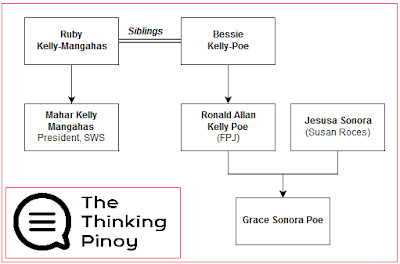 Ruby and Bessie are siblings [SC GR 161434], so that Grace Poe is Mangahas’ niece. This close relationship obviously suggests a conflict of interest, with at some camps calling Uncle Mahar “unethical” [Balita, Manila Times] for refusing to take a leave of absence despite the fact. But he didn’t, and this spectre haunts Mangahas and SWS up to this day, with staunch PGMA Ally Rigoberto Tiglao as one of the fiercest critics [Tiglao 2015]. The fact that Poe actually leads SWS surveys for most of recent history doesn’t help. 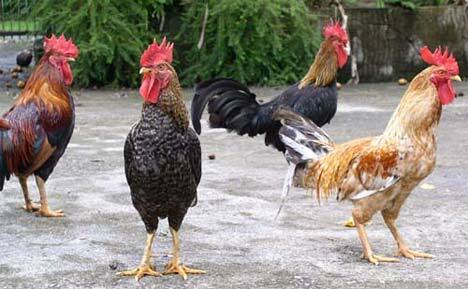 Moreover, the experimental survey methodology – using mobile phones for sampling – further complicates the already-complicated [Inquirer]. Now, just imagine everybody’s shock last night after finding out that Duterte has finally overtaken Poe In the latest SWS Survey conducted March 26th to April 1st [Businessworld]. Thinking Pinoy is tempted to provide rigging-related theories to explain recent development, TP believes proving criminal intent is something that is best left to lawyers. Instead, let us give SWS the benefit of the doubt (even if it’s difficult) and focus on two things: the SWS survey methodology and the evolving political landscape. That is, let’s assume that SWS exerts no conscious effort to skew sampling bias to its bet’s favor. The original SWS sampling methodology that we got accustomed to these past few months involves a sample population that were given mobile phones to enable quick polling. This method is useful when one wants to immediately gauge public opinion after a major events, just like what SWS did after the second Pilipinas Debates [ABSCBN]. SWS uses the same voter-respondents in every SWS Mobile Survey. Whether it’s to cut down on costs (it’s expensive to provide over 1000 phones every time) or a conscious effort to skew sampling bias to favor its vested interests, there’s no way to know at this point. However, the fact remains that the presence a disproportionate number of pro-Poe respondents in the original “random sample” implies pro-Poe survey results in all the succeeding mobile surveys, as the same people are used every time. Additionally, because there’s a constant line of communication between SWS and this set of respondents, it’s also possible that some shady deals could have been struck between the two. But that’s another story. Now, April SWS results does not use this method. Instead, the First Quarter 2016 Social Weather Survey involves traditional face-to-face interviews with a sizeable sample of 1,500 adults. At least in theory, the April Survey is less prone to bias than its immediate predecessors. In terms of sampling, the April SWS Survey is a totally different survey from – though arguably more reliable than – the previous SWS Mobile Surveys. However, saying “Poe’s figures ‘worsened’ and Duterte’s ‘improved’” is not totally accurate: it’s best to just infer that Duterte is nominally on top, but is at a statistical tie with Poe. Nothing more, nothing less. But then, the public doesn’t care about that: they just want the final numbers. After all, most people hate Math anyway. But if there’s one takeaway that TP wants you to have, it’s that this new face-to-face survey is more accurate than the previous mobile surveys. That’s it. Another factor to consider is are the date on which the survey was conducted: March 26th to April 1st. Poe was accused of defending Marcos Crony Danding Cojuangco [TP: Poe Pagtatakip]. Poe flubbed her answer to a Duterte’s foreign policy debate question [TP: Coast Guard]. Motion for Reconsideration on Poe’s DQ case was still pending [TP: Poe DQ MR]. Poe’s feistiness in the 2nd Pilipinas Debates [Philstar] may have been perceived as counter to her soft-spoken public image. Duterte’s nationally-televised line, "I can tell you now that I will provide the leadership — not only the platforms, but leadership." [CNN]. The first point directly contradicts Poe’s anti-corruption, pro-poor platform. She castigates Binay [Inquirer] for “pangungulimbat (plunder)” but, with the same breath, defends Danding Cojuangco [Inquirer], who’s an even worse plunderer. While she probably got a pass when she first said it in a Quezon sortie, the public may not have been as forgiving when she said it again [TP: Poe Coco Levy], despite the numerous reminders for various sectors that she’s wrong [TP: COIR]. And the fact that Duterte said on national TV that his mother also was a Coco Levy Scam victim [GMA] doesn’t help Poe’s cause, either. The second point directly reinforces public perception that Poe lacks relevant experience. Duterte’s tough question about China bombing PH coast guard cutters required a short and specific response, something that Poe failed to give [TP: Foreign Policy]. The third point should not have been much of a big deal. After all, Poe has led the surveys even with disqualification issues – the proverbial sword of Damocles – hanging over her head. For one, it appears that the public doesn’t care about it anymore, with Pulse Asia saying that the expected post-SC decision rating surge went to Duterte instead [ABSCBN]. The fourth point shows Poe displaying a confrontational and rather crass demeanor that’s contrary to the graceful, ultra-feminine, soft-spoken Poe that we know [Inquirer]. Personally, Thinking Pinoy appreciated this, as I would rather have presidents who tackle issues head-on that ones who constantly beat around the bush. However, we must remember that the bulk of her supporters come from Classes D and E, who are more likely to vote based on emotions. Now, connect the dots. The fifth point served to aggravate whatever the second point did to Poe. Let’s be honest here: Duterte’s image is brash and overbearing, but he leads all the four debaters in terms of reputation for getting things done, i.e. political will. The presidential race has become a two-way fight between Duterte and Poe. Of course, this latest SWS survey is not enough to infer that, but its results are now consistent with two other major survey groups Standard-Laylo and DZRH-Emeer2 [TP: Duterte leads 3 of 4]. Pulse Asia is still nowhere to be found this month. First, TP believes there’s virtually no way she can win against Duterte in terms of reputation for political will. She has to give up on that one. Third, moderately revise her platform by considering feasibility. It’s one thing to make 20 awesome promises, but fulfilling them is another matter altogether. Add the fact that she swears she won’t favor Danding, we can’t expect Danding to help her political goals during her term. Danding is evil, but he’s not stupid. She admits herself that she sorely lacks experience [Inquirer]. How can she build the utopia she promises when she lacks the raw materials? That’s something that her campaign team can work on. Fourth, she can also harness her oligarchic connections [TP:Poe Connections], including Uncle Mahar, to manipulate survey results and hopefully sway public opinion, or at least make a rigged May 9 elections look more believable. Fifth, she can strike a secret deal with the ruling Liberal Party, requiring the latter to drop Mar Roxas and support her instead, if only to avoid a Duterte Presidency. In exchange, she can promise favorable treatment for the Aquino Administration post-June 2016. The LP may believe this promise, as she has already bared plans of retaining some members of the Aquino cabinet [Rappler]. However, she may need to plan in advance on how to avoid (or deal with) an EDSA People Power as a potential side effect [TP: Stranger]. We all know that Duterte probably has the most zealous supporters, with some camps calling their devotion "fanaticism" [Newsdesk]. I guess they also know how many people were in Duterte's Alabang Rally, and that's just Alabang. Sixth, strike a deal with United States. After all, she most likely has connections with that foreign government, given her three kids are American citizens, and her husband is even a US military veteran [Rappler]. The downside, however, is it's unlikely that China will just sit down and watch. For one, China's state-controlled media indicates that China is willing to take a more conciliatory stance vis-a-vis the South China Sea issue in Duterte Presidency [Global Times CN]. Duterte also said earlier, "We cannot go to war [with China] because we cannot win it. I will not waste the lives of Filipino soldiers and policemen. [Inquirer]"
But if worse comes to worst and she runs out of ideas, she can still try eating a live chicken on Prime Time TV, then promise to do it every day for the next six years. That would surely pique public interest. And if so, I hope she devours a native breed, in consonance with her claims of nationalism.